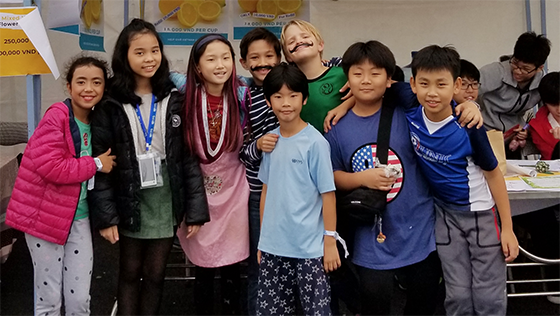 Several groups of students from the elementary school signed up and ran their booths at the Spring Fair to fundraise for the organisations that they support through the Service Learning programme. United Business Kids (UBK) raised money for Project Sprouts which is a Hanoi based initiative bringing necessary supplies to students in villages throughout Vietnam. Grant in grade 5 said "We wanted to make more money to help Project Sprouts because they help more kids pursue their education and they use the money to supply kids with basic needs like clothes and food. We got the idea at Market Day to donate to Project Sprouts and we wanted to keep doing that at the Spring Fair. " Agustin in grade five said " We worked through our recess times and on the weekends to get our booth ready and organised for the Spring Fair. It was a fun experience being the seller instead of the buyer. We know our money will go to help other kids outside of UNIS Ha Noi. We learned a lot about selling and techniques to be better sellers. We learned how to organise ourselves and be leaders. We were all leaders in some way, because we all had a part to play and different roles." The UBK made lemonade, cookies, cupcakes, popcorn and muffins for their fund raising activity. 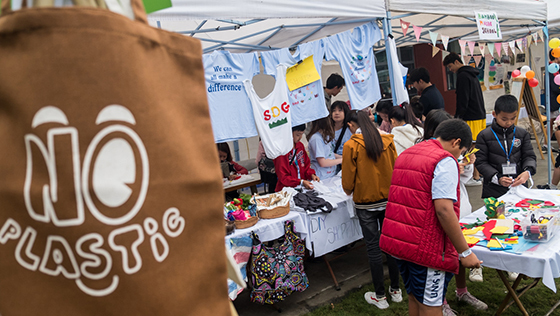 The group also realised selling items in plastic bags was not working when they sold products during Saturday soccer, so they decided to be more sustainable and use paper bags instead. Endric said "It feels cool seeing that in just a couple of a months we started a business that was small and now we are selling to so many people at Spring Fair. We've made a plan for the first Saturday of every month. We will also sell baked goods and lemonade near Anita's Cantina at the dog park. We will sell lemonade and cookies there from 10.00 to 12.00 and continue to raise money for Project Sprouts"
Another group started raising money for an organisation at their Market Day and decided to continue their fundraising by setting up a booth at Spring Fair. Sooa in grade 4 who is a founding member of the Water Warriors said, "For Market Day we chose to help people who do not have clean water. But we didn't earn enough money to help those people and buy a water filter at that time so we decided to go to Spring Fair and sell food and lemonade to make more money. We work with the Life Straw to get a village cleaner water. We are researching right now to see what villages in Vietnam need clean water. Life Straw follows the humanitarian entrepreneurship business model which devotes its entire innovative platform towards producing breakthrough products and solutions for disadvantaged people. Arthur in grade 1 created colorful key chains and ornaments to sell at the fair in order to raise money for Operation Smile, an organisation providing free reconstructive surgery to more than 21,300 patients and dental care to more than 10,900 patients with cleft lip and cleft palate in Vietnam. 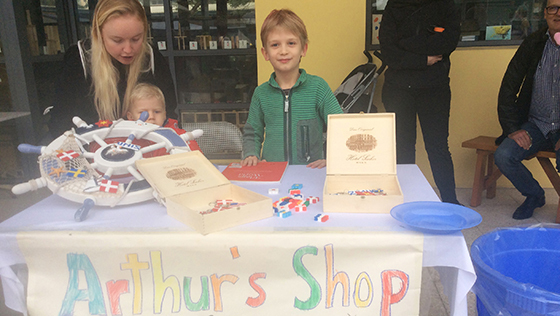 Arthur said " I really wanted to help out at the fair and I also wanted to help people have a better life. I just didn't think about me. I wanted to help people get their smiles back. I went to Operation Smile and asked them if they needed money and I donated all the money from the fair to them. I want to do this again because I think helping people have a happy life is what we should all do. " At the Spring Fair 2019 the S.D.G. Guardians took the opportunity to teach people how to up-cycle unwanted T-shirts into reusable bags. Their idea is in a short space of time without any sewing skills, you can tie a knot to make a bag. The group also wanted to raise public awareness about the local social enterprise- DONKEY BAKERY. This business employs people who have physical and sensory challenges which means they are not usually able to find work. Donkey Bakery avoids using single use plastic as they are mindful of how detrimental it is to the environment and want to use sustainable practice. They also promote the use of reusable bags that the tailoring section of this business make alongside many other sustainable and up-cycled items such as felt toys and lunch bags made from recycled banners from UNIS Ha Noi. 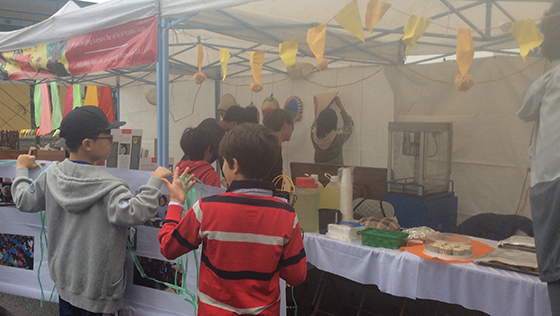 Two Donkey Bakery tailors joined the SDG Guardians at the Spring Fair. Customers were able to choose their favourite patches to be sewed onto the recycled T-shirt bags. The S.D.G. Guardians would like to thank the tailors for their great participation and also thank everyone who supported our stall. Please continue to support Donkey Bakery and enjoy their delicious baking. 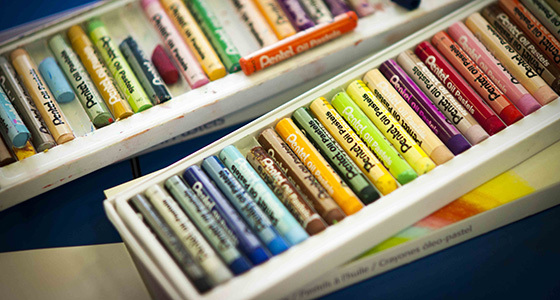 The products they make are great gifts.